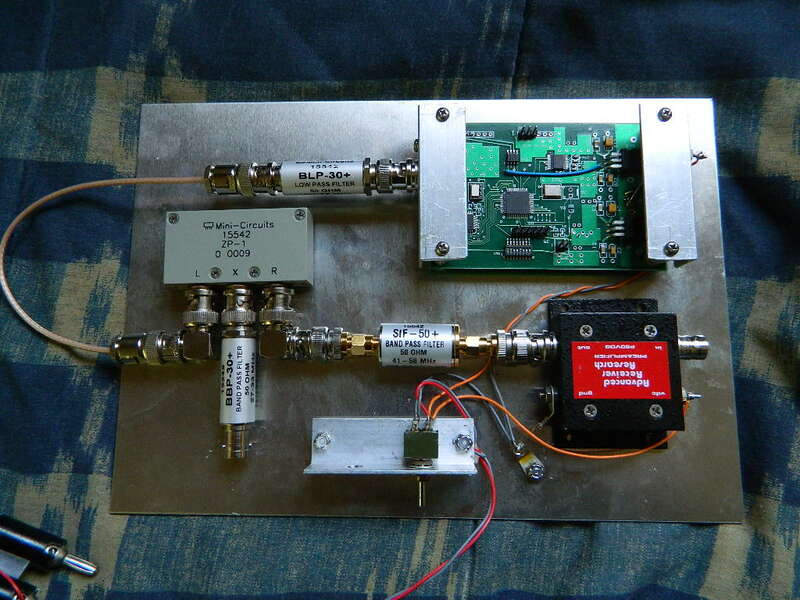 The item shown here is a six meter to ten meter (50 MHz to 28 MHz) receiving converter built from readily available off the shelf components. It features 49 through 54 MHz coverage converted to 27 through 32 MHz, a low noise GaAsFET preamplifier, and a low noise DDS synthesized local oscillator. The performance of this converter is really very good. It is very likely that this is about as good as it gets short of cooling the converter with liquid nitrogen! What do I need to make this ? A 50 MHz GaAsFET preamplifier from AR^2, model P50VDG or equivalent. One DDS Synthesizer, with mounting hardware, tuned to 22 MHz, with approximately 0.5V p-p output into a 50 ohm load. One Minicircuits BLP-30 low pass filter. One Minicircuits ZP-1 diode ring mixer. Two BNC right-angle male to female adapters. One piece of sheet aluminum, approximately 7 inches by 11.5 inches. Some double sided foam tape to mount the mixer and the preamp to the metal plate. One #4 solder lug, with hardware for the grounding point. One 8-inch 50 ohm coaxial cable with male BNC connectors. How do I assemble this thing ? Start with the aluminum mounting plate. Measure the distance between the mounting holes required for the DDS board. Using the image of the converter on this web page as a guide, mark the location of the holes for the DDS board mounting. Drill four holes in the metal plate to mount the DDS synthesizer. The synthesizer shown comes with mounting hardware. Next, drill holes to mount the switch bracket of your choosing. The one shown here was made from a 3 inch long piece of 1/16 inch thick, 3/4 inch wide aluminum angle stock. Mount the switch bracket with switch, the solder lug for the grounds, and the DDS board to the metal plate using 4-40 hardware. Connect the BLP-30 low pass filter to the BNC jack on the DDS synthesizer module. Connect a BNC male to SMA female adapter to the GaAsFET preamplifier output port. Connect the male connector of the SIF-50 band pass filter to the female SMA adapter that was just installed on the preamplifier. Connect an SMA male to BNC male adapter to the SMA female connector on the SIF-50 band pass filter. Connect a BNC right angle adapter to the RF input port of the ZP-1 mixer (this is often marked with the letter "R"). Connect the BNC adapter from the SIF-50 filter to the right angle BNC connector on the RF input port of the ZP-1 mixer. Apply strips of double sided foam tape to the bottom of the ZP-1 mixer, and the bottom of the GaAsFET preamplifier. Position the assembly carefully, then press them firmly onto the metal mounting plate. Connect the BBP-30 band pass filter to the IF output port of the mixer (usually marked with an "X"). Connect a short coaxial cable from the local oscillator port of the mixer (usually marked with an "L") to the output of the BLP-30 low pass filter that was installed on the DDS synthesizer earlier. Prepare a suitable length of gray 24 gauge stranded, insulated wire. Connect the ground lug on the end of the DDS board (next to the feed through capacitor) to the ground lug that was installed on the metal plate earlier. Prepare a suitable length of gray 24 gauge stranded, insulated wire. Connect the ground lug on the GaAsFET preamplifier to the ground lug on the metal plate. Prepare a suitable length of orange 24 gauge stranded, insulated wire. Connect the V+ feed through capacitor on the DDS synthesizer board to the normally open contact of the on/off switch. Prepare a suitable length of orange 24 gauge stranded, insulated wire. Connect the V+ feed through capacitor on the preamplifier to the normally open contact of the on/off switch. Prepare red and gray insulated wires for the power cable. Connect the red wire to the common contact of the on/off switch. Connect the gray wire to the ground lug on the metal plate. Twist the wires gently to provide some shielding against noise and to make things a little neater. Use a nylon cable tie to stress relieve the power wiring so that it won't be broken easily if something pulls on the wire. Connect an antenna to the input of the GaAsFet preamplifier. Connect a receiver to the BBP-30 band pass filter output jack. Connect the red and gray power wires to a clean, regulated power supply that can deliver 11-15VDC @ 600 mA. Red is positive, gray is negative. Turn the receiver on and tune it to 28.000 MHz. Make note of the noise level in the receiver at this point. Turn on the converter power switch. You should hear a slight increase in the receiver noise floor, indicating that the local oscillator and preamp are alive. The received 50 MHz signals are converted to 28 MHz by subtracting the 22 MHz local oscillator from the incoming 50 MHz signals. So, when the 28 MHz receiver is set to 28.075 MHz, for example, the actual received frequency will be 50.075 MHz.